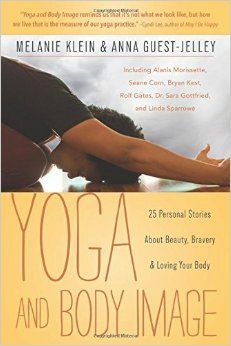 Yoga and Body Image is a collection of 25 personal stories from on and off the mat told by a mix of yoga teachers and practitioners, some of them famous (Seane Corn, Rolf Gates and Bryan Kest). The essays are a testament to the healing power of asana and illustrate how “yoga is an approach to life” for many of the contributors, including well-known musician Alanis Morissette. This unusual anthology is the brainchild of sociologist Melanie Klein and Curvy Yoga founder Anna Guest-Jelley, the book's co-editors. The essays are a testament to the healing power of asana and illustrate how “yoga is an approach to life” for many of the contributors. Sad, poignant, and always honest, the writers share how they came to yoga, often in times of crisis. For celebrated Power Yoga teacher Bryan Kest, that moment came after a few stints in jail, when he was sent to live with his father in Hawaii. The only house rule: “Do yoga every day or move out.” Yoga gave Bryan a way to redefine his own masculinity after a childhood spent emulating his angry father and trying to fit in with a crowd of tough kids in the suburbs of Detroit. It offered an alternative path to the one he was on. Professor Audrey Bilger reveals how her morning practice helped steel her against the drama unfolding on her small college campus. Virabhadrasana, the warrior poses, helped her reclaim her power on the mat, giving her the courage to speak up against an attack by a group of colleagues. She came to see the warrior series as a way of allowing herself to be vulnerable, even in the face of “rejection, judgment, and hostility.” By confronting her antagonists in an open-hearted way, she humanized her workplace and forged new relationships with co-workers. In an interview with Melanie Klein, rockstar Alanis Morissette confides how fame and public scrutiny of her body at a young age contributed to twin eating disorders, bulimia and anorexia, and how a deeply spiritual yoga practice has helped her recover and create a more balanced life. Joni Yung, an athlete and self-described “short, middle-aged, average looking Asian woman,” writes how she found yoga accidentally, after tearing a ligament in her knee in a ski accident. While Yung embraced the practice, she quickly felt out of place in a sea of thin, beautiful, white people at her local studio. "Yoga isn’t about looking your yoga, it’s about living your yoga." Yung describes feeling self-conscious about her body and inadequate in class—a sentiment echoed again and again in the book. Through her longtime practice, she eventually concludes, “Yoga isn’t about looking your yoga, it’s about living your yoga,” a message that perhaps best sums up this collection. What makes this book different and particularly refreshing is its diversity of voices and the honesty with which each contributor takes a look at his or her own life. We hear from men and women, gay and straight, white, black, Asian (and other ethnicities), and practitioners with and without disabilities. 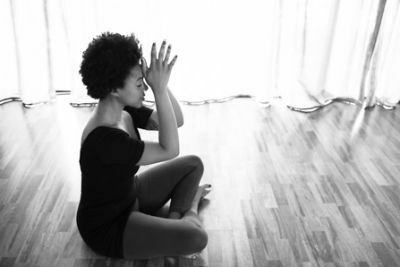 Through their diverse backgrounds and experiences, a common thread emerges: Not only does yoga have the power to transform lives, its reach in America extends far beyond what most people realize.